Welcome to Fizzopolis! Home to the world’s greatest soda pop, Fuzzwonker Fizz, and the Fizzies—fuzzy, fizzy creatures that live only in Fizzopolis. Join Harold and Floyd in this wacky new illustrated series from bestselling author Patrick Carman and Emmy Award–winning illustrator Brian Sheesley. 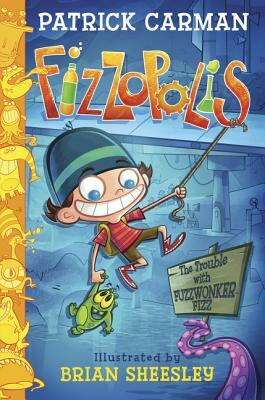 Harold Fuzzwonker is an ordinary kid with an extraordinary fizzy friend, Floyd. But Floyd’s a secret—like a top super-secret. Harold must protect him, as well as the family recipe for Fuzzwonker Fizz, from the evil Snood Candy Factory. But it’s hard to guard a secret when he’s your best good buddy and he always escapes from your backpack! Harold chronicles his epic adventures—with a little artistic help from Floyd—that are sure to have Fuzzwonker Fizz squirting out your nose! Patrick Carman is the New York Times bestselling author of such acclaimed series as the Land of Elyon and Atherton, the teen superhero novel Thirteen Days to Midnight, and the first two books in the Pulse series. A multimedia pioneer, Patrick authored The Black Circle, the fifth title in the 39 Clues series, and the groundbreaking Dark Eden, Skeleton Creek, and Trackers books. An enthusiastic reading advocate, Patrick has visited more than one thousand schools, developed village library projects in Central America, and created author outreach programs for communities. He lives in Walla Walla, Washington, with his family.